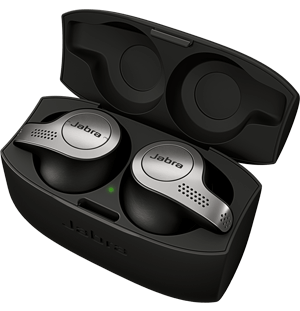 At Jabra, we're here to make your life sound better. Want to rock out to your favourite band with an arena-like experience? Or do you require a world-class office headset that can block out a busy working environment thanks to state-of-the-art noise cancellation technology, and offer the very best call management tools available? It's all possible when you choose the advanced Jabra Elite series. First, let's go wireless. Every model in the Elite series is free from wires, meaning you can dance, run, jump or simply take important client calls on the go without worrying about the restrictions of wires. All-day power ensures you're never left without charge too - the Elite 25e enjoys a huge 18-hour battery life: imagine how many albums you can listen to with that. When it comes to the important stuff - sound quality - our products promise to perform beyond your expectations. Connect seamlessly with Bluetooth, enjoy unbelievable clarity and be fully in the moment. 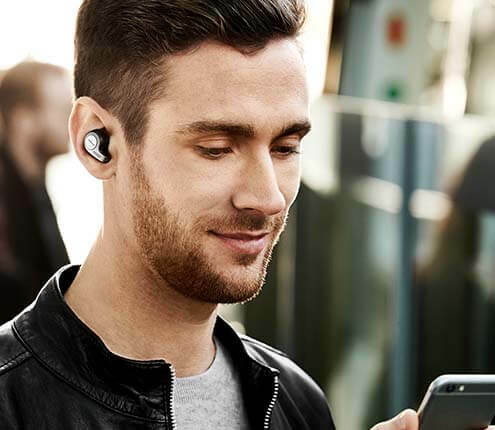 Professional-grade ANC cuts out disruptive chatter and background noise, enabling you to fully focus and communicate without any issues, all while four-microphone technology combats wind to ensure you can hear and be heard when speaking with clients and colleagues outdoors. Customisable equalisers, activated via the Sound+ app, make sure music lovers' needs are met too. Adjust the bass or up the tempo - it'll feel like you're really watching a live performance, straight from the front row. Busy lifestyle? The Elite Active 65t and Elite Sport are designed specifically for you. Engineered to be durable, water-resistant and offering in-ear stability thanks to their secure fit, whatever you choose to do with your day, you can always rely on our sports earphones to deliver the highest all-round performance - no strings attached. Whatever you need a new pair of headphones for, you can trust that the Elite series from Jabra are the best choice available - for both calls and music. Not sure what model to choose? Just get in touch with our experts, they'll be delighted to help you select the right pair of headphones for your needs.